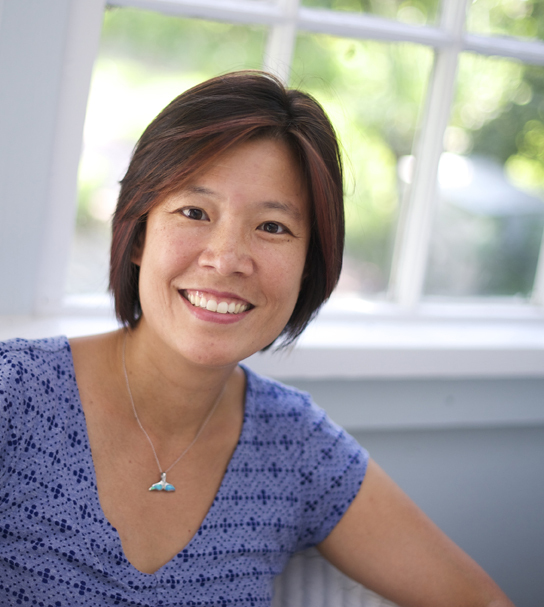 Welcome to Kidlt411 co-founder Sylvia Liu in the Author Spotlight! Her debut picture book, A MORNING WITH GRANDPA, illustrated by Christina Forshay (Lee & Low Books), is coming on May 1. Be sure to enter her giveaway of a signed copy of her book and stay tuned for her blog tour that begins with this post. Congratulations on winning the 2013 NEW VOICES Award from Lee and Low for A MORNING WITH GRANDPA. What an accomplishment! Can you tell us a little about the call that you had won? It was so exciting. 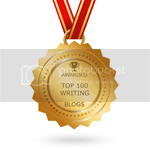 When my editor Jessica Echeverria introduced herself, my first thought was that I was a runner up, because it didn't occur to me that I could be the winner. After the call, I danced around the house and called my husband and parents. I was sworn to secrecy for another three weeks, which was really hard. I didn't even tell my critique group. A MORNING WITH GRANDPA is your debut picture book. What was one surprising thing you learned about the publication process during the making of this book? The story is about a grandfather (Gong Gong) and his granddaughter (Mei Mei) spending time together, teaching each other tai chi and yoga. She's hyper and he's not as bendy as she is, but they have a grand time. I was pleasantly surprised by how thorough the editing process was. My manuscript went through many drafts after it was accepted, and each time it was thoroughly edited. Over the course of the months, the story got better and better. It's humbling to have an editor care as much about the story as I do. You are an author/illustrator as well as a lawyer. How supportive have your parents and family been of your career change? When did you decide to make the switch? My parents and family have always supported me, and I'm grateful for that. Since college, I knew I would first have a respectable career and then a creative career (because at 20, I wasn't ready to buck the received wisdom to make the most of my academic credentials). In college, I studied a practical major but took studio art courses. As a lawyer, I took night classes in art and illustration. In my mind, I would practice law in my 20s and turn to illustration in my 30s. Between enjoying the law (protecting the environment at the U.S. Department of Justice and the nonprofit Oceana) and starting a family, the timetable slipped. I made the switch to illustration ten years ago, in my mid-30s. I started writing my own stories about five or six years ago. Give us an insight into your main character. What does Mei Mei and Grandpa do that is so special? Mei Mei is like so many kids--curious, fun-loving, and a sponge soaking up new experiences. She and Gong Gong have a fun, teasing relationship. It doesn't matter if neither of them quite "gets" what the other is teaching because the important thing is that they are together. Your book involves tai chi and yoga. How much research did you have to do when writing it? I have practiced a tiny bit of yoga and tai chi, enough to know I didn't know a lot about either. I took classes, read, and watched videos to describe the poses in the story. I've watched my dad do tai chi since I was young, so I was comfortable writing about it. What advice would you give to your more inexperienced writer self? Connect with the kid lit community, take courses, and go to more writing conferences earlier in your career. I spent a lot of time spinning my wheels working in isolation. 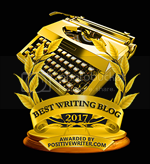 Once I connected with others and found a critique group, my writing improved by leaps and bounds. What a hard question! I love so many books, and I don't think I could be the original author of any of them, as they are inherently someone else's work. But I would love to inhabit picture book author-illustrator Shaun Tan's mind sometime. His books are magnificent (especially THE RABBITS, THE ARRIVAL, and THE LOST THING). 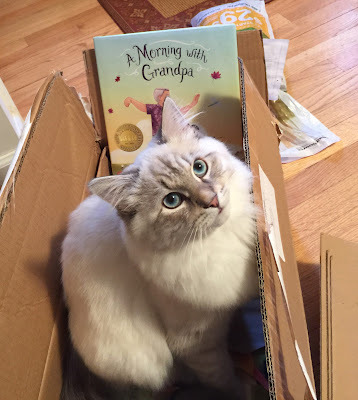 I am pleased to announce the start of the blog tour for A MORNING WITH GRANDPA. Over the next few weeks, please stop by these blogs to learn more about Christina Forshay, me, and our new book. Thank you so much, and I didn't even think about the Father's Day angle! Thanks Sylvia for your insightful interview showing us your book progress I look forward to reading it soon. Thank you, Sharon, for stopping by. Congratulations Sylvia! Love inter-generational stories, and this one looks fabulous. Thanks for your support, Cathy. What a special honor to have a debut book receive top honors! I love that the story demonstrates calming arts to children with a cross-generation focus. All the best! Congratulations! I look forward to reading the book and following your book tour. Thank you, Dow. I have loved following your career and hope to meet you too. I love the polar bear image and can't wait to see where that may lead you. Congratulations, Sylvia! Thanks, Wendy, fellow On the Scene-r! Awesome, thank you! I will look forward to seeing your debut. Congratulations, Sylvia! 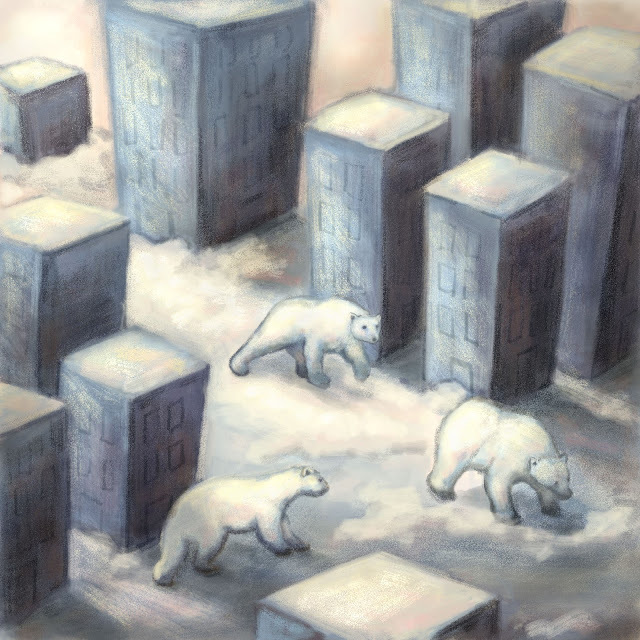 And I love your urban polar bear illustration too! Thanks, Maria. Kind of like your coywolves, right? Thank you, Sylvia, for sharing your experience as a writer and illustrator. I look forward to seeing what happens with the urban bears! You are too sweet, as always! Great interview! I'm looking forward to reading your book! Congratulations, Sylvia! I can't wait to read A Morning with Grandpa. Thanks for telling us the backstory of the story. You're an inspiration, Sylvia. Congratulations! And that polar bear image. It's so dreamy. It sounds wonderful! I look forward to reading it. Congratulations! Congratulations, Sylvia! I love the concept of A MORNING WITH GRANDPA. Was that your working title? Funny you should ask. It was originally A Morning with Gong Gong but it got changed in the editorial process. I explain why in another post later in the tour. Congratulations, Sylvia! Looks like a wonderful book! Congratulations, Sylvia! What a lovely book! :) Looking forward to reading it! I found it so interesting to hear the story behind Sylvia's book. Congratulations Sylvia!!! I'm looking forward to reading it. Glad you stopped by, Darlene. Congratulations on your book debut! I love the idea of a grandfather and granddaughter finding a common active interest. The illustrations are so soft and warm too (even the polar bears!). Thanks, Danielle. The illustrations in A MORNING WITH GRANDPA are by Christina Forshay. I love the cover and the idea behind the story. The fact that we can spend quality time with people we don´t always understand or whose mindset we don't inhabit. Good luck and congratulations. I remember the day you won the Lee & Low contest and now your book is published! remember the day you won the Lee & Low contest and now your book is published! Congratulations! Thank you, Romelle, for being there from the beginning! Celebrate!!! I'm so happy for you! Great work! I will! Thanks so much. What a wonderful day for you. Happy May! Congratulations and gratitude for your sharing so many insights. Your ability to project, plan, and as I see it stick to a timetable you created are amazing. Even though I didn't have your early family support or vision of how to get there. I find it inspiring to not give up on my present timetable. Sticking with it as much as one can and believing in oneself seems to be the ticket. I am curious about the reason you did not illustrate your own authored book. Looking forward to reading all your blogs! Thanks so much! My publisher wanted to hire a different illustrator and I trusted their vision for the book. You make your ideas so clearand A day with Grandpa looks absolutely delightful. Thanks for taking the time to share with us. Congratulations, Sylvia! It's a very interesting interview and a great chance to take a look into your artistic insight. I also like the illustration piece above which depicts a surrealistic atmosphere. Thanks Sylvia for your insightful interview in NaPiBoWriWee and for showing us the progress of your book. Great idea! Thanks for stopping by the blog tour! Loved hearing your insights into these excellent questions. And of course I have loved following the evolution of A MORNING WITH GRANDPA in our critique group. I am thrilled for you! Go, Penguins! Guess what I'm doing today, Sylvia...I'm catching up. So fun to hear more about you and your book!